Students using tablets from the Instant Network Schools (INS) project in Kakuma Refugee Camp in Kenya. 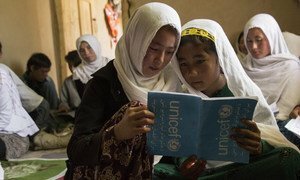 She said that contrary to popular belief, 92 per cent of the global population of school-aged refugees live in developing countries. This is further complicating the work by UNHCR. Ending the press briefing, Ms Sheehy explained how the UNHCR is helping refugees to educate themselves. Innovative options like online courses with a curriculum and standardized certifications, but also collaborations with existing higher educational institutions, some of which are already offering entry courses with diplomas for refugees, are part of the solution. However, financing remains the biggest challenge and what is needed is better funding, the Senior Education Advisor stressed.